The two-altared church was erected in 1734, though the main altar was consecrated in honor of the Image of the Savior “Not-Made-by-Hands”. It took its name after the side-chapel in honor of monastic martyr St. Eudokia. The Church of St. Eudokia is linked to a name of Eudokia Mikhlyaeva, the wife of the prominent tradesman, the benefactor of the cathedral of SS. Peter and Paul Ivan Mikhlyaev. Eudokia Mikhlyaeva donated for construction of the Church of Descend of Holy Spirit and the Pyatnitskaya Church both, but there is no documentary proof yet. The Church of Descend of Holy Spirit is a typical sample of Russian baroque. In contrast to the cathedral of SS. Peter and Paul or the Pyatnitskaya Church it is ordinary enough by its appearance. There were many churches of this type in countryside. The parish of the Church of St. Eudokia was inhabited by ordinary people and considered the poorest one in Kazan. The parishioners could not afford dona­tions to reconstruction works. And that was the reason why its original appearance actually left whole. In 1932 the Church of St. Eudokia was shut down. Fr. Pavel was the last rector of the church. His grave is near the eastern wall of the side-chapel in honor of monastic martyr St. Eudokia. He died in 1934, two years later the church was closed. 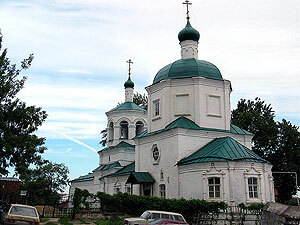 In 1998 the Church of St. Eudokia was transferred to the Kazan Diocese of Russian Orthodox Church. On June 24, on commemoration day of the icon of the Mother of God “It Is Truly Meet” divine services were resumed. Church clergy: Fr. Dimitry Yevgrafov is a rector.